Here comes the Tegu Tram! 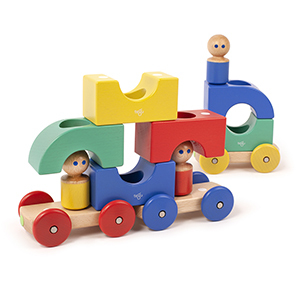 Enjoy three magnetic 'cars' and three Tegu characters. Each car contains 3 magnetically inter-changeable parts - kids can sort and stack the pieces anyway they like! The magnetic characters love to ride on the tram or play on their own. 15.2 x 56 x 43 cm. Compatible with all Tegu Products! This is much more than just a Tram, its also a construction toy. Stack the pieces high and defy gravity with the power of magnets! 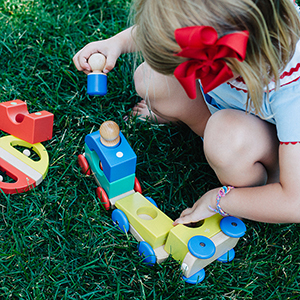 The Tegu Magnetic Tram includes three fun character pieces, perfect for sparking a child's imagination. Whether the characters ride on the Tram or play on their own, they are bound to fuel hours of fun! How many different vehicles can you build? A bus? A train? Maybe even an airplane? 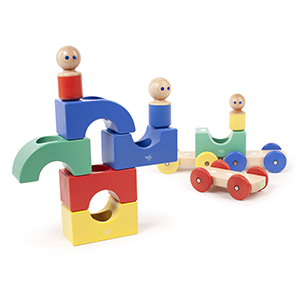 Imaginations will run wild with three magnetic wooden chassis pieces, 6 body pieces and 3 character pieces!